This box contains 4 packs of vegan bacon. 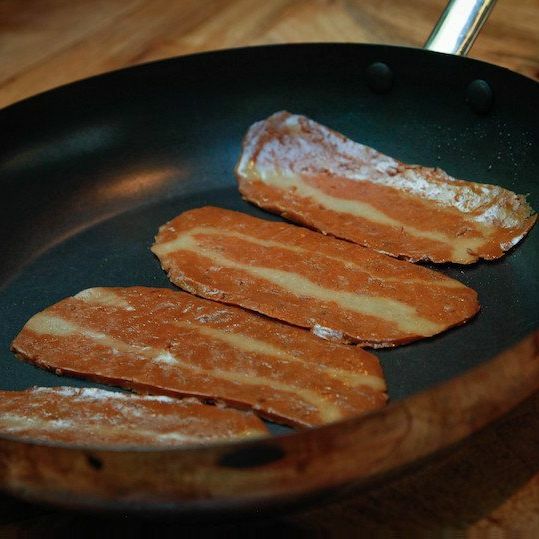 Each pack contains 4 large rashers, which can easily be made into 8 smaller ones. 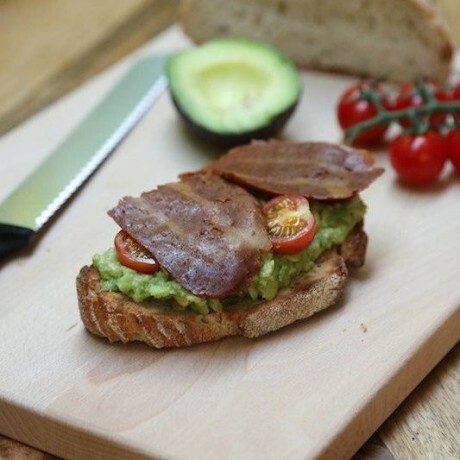 Not just made to look like streaky bacon, the streaks in these rashers have been reinvented to create a delicious play on flavours and textures. Smoky, salty, and delicious, with a hint of maple sweetness around the edges. Perfect used in a full vegan breakfast, on a stack of pancakes, in a BLT or to top your favourite vegan burger. Wheat GLUTEN, Water, Balsamic Vinegar, Yeast Extract, SOYA Protein, Beech Wood Liquid Smoke, Sea Salt, Molasses, Maple Syrup, Onion, Garlic, Beetroot, Smoked Paprika. Allergens are shown in bold. I loved the idea of vegan steaks but unfortunately they weren't for me. The idea is there but the taste wasn't. I will say the texture was one of the closest to meat I have had since giving up. I will definitely be trying some other food products though as I do love this site! A five star review is well deserved. A five star review is well deserved. Having tried many of your products I can say with certainty that they are extremely tasty and of great quality. The steaks are my personal favourite, so delicious and filled with healthy natural ingredients. I wish you all the best with your blooming business and look forward to shopping with you again in the very near future. Without a doubt the best vegan meat. This product is dispatched by Sgaia's Vegan Meats. This item has a shipping weight of 500g. Grown (not born), real vegan meat that is handmade from scratch.